As most of my readers are painfully aware of at this point, I am a clinical psychologist who specializes in using and training people in evidence-based practices for various mental health problems. I do this both as part of my work as a professor and via dissemination of scientifically accurate information about psychology in places like this blog, my YouTube channel, and my academic writings. A major part of what I do as a professor and clinician is to also teach people how to critically analyze claims, both about life in general and about health claims specifically. This means teaching people how to distinguish between pseudoscientific and scientific, evidence-based treatments for health problems. I encourage educating people when they claim that “alternative medicine” or “complementary medicine” are somehow equivalent or superior to treatments that we have solid, repeatable, verifiable evidence for using. Of course, I also enjoy a good laugh, both at myself and at folks who try to claim they have amazing magic powers and that they are happy to share their magic with you (for a low fee, of course). Teaching, writing, and giving talks about pseudoscience, I am more well versed than the average person about the vast array of nonsense being peddled to the public, but am always interested to learn about new entries to put into my personal Rolodex of Deceptive Practices (TM). That’s why I was very interested to see a term I’d never heard before this week: LightWorker. And before you ask, no, it’s not an electrician who specializes in bringing joyous, glorious brightness into your homes and businesses. Those people are amazing. So what is a LightWorker? According to one of the many sites that talk about this, “some individuals agreed to take on “global missions,” which involve helping people, animals, the environment, or a cause other than themselves.” Well that sounds good. Myself and a good number of my friends, especially those in health fields, would seem to fit that definition. I wonder what else being a LightWorker involves? The great news is that, as a lightworker, you’ve been making a positive difference your entire life. You radiate healing energy that soothes others and brings peace wherever you go. That’s because your main global purpose is to love, which is something you do naturally. You care about people; and you wish that everyone could be happy, healthy, and well provided for. You are a giver. So, the form that your mission takes is secondary as long as you extend Divine love. In other words, when you think about a career as a spiritual healer or teacher, the type of work you do isn’t important. Whether you teach or practice Reiki, Angel Therapy, mediumship, or some other modality . . . if it’s done from a place of loving service, everything else is details. Dammit. I was starting to warm up to being a LightWorker, and then they had to start pulling out the nonsense like all “energy healing” and mediumship. Looks like I am just destined to keep being a HeavyWorker (but I’ve lost some weight recently, so I may be down to MediumWorker before too long!). Is spirituality important to you? Do you want to learn how to channel your natural clairvoyance? Do you avoid drinking Edmond tap water not because you prefer Franzia, but because the fluoride will crystalize your pineal gland, inhibiting your ability to tap into your third eye? Are you high at this very moment? Then the Sacred Circle of Lightworkers is the group for you! The “academy” aims to train spiritualists throughout the metro to become Lightworkers, or psychic mediums. With Patti S. as the host, you’ll tap into your psychic ability while she taps into your wallet. Is spirituality important to you? Do you want to learn how to channel your natural clairvoyance? Do you avoid drinking Edmond tap water… Hold up. Didn’t I just write about this? I guess there is a second LightWorker group. Come on, does the metro really need more than one psychic medium training facility? We really don’t seem to be in a short supply of middle aged women ripping off the grieving loved ones of the recently deceased. And that’s cool, use that social media platform and your Constitutionally assured freedom of speech, LightWorkers. Defend your scientifically indefensible use of “healing, spiritual gifts, empowerment, law of attraction, psychic/psychic mediumship, building a bridge between Spirituality and Christianity, Cosmic Wisdom, Light Worker/Light Working, Christ Consciousness and Christian Mysticism” that’s fine. Even if psychic powers are fake and mediumship is nothing more than cold reading, you have the right to do so. 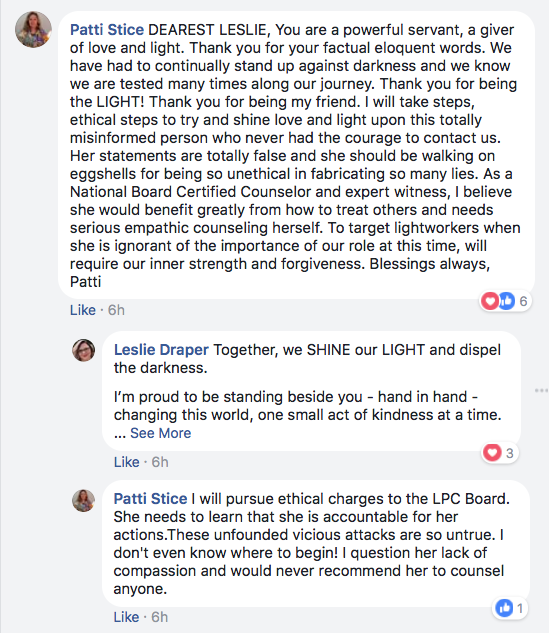 However, one Leslie Draper of My LightWorker Institute decided to take things further, publicly sharing a status on Facebook about the article. Her status, then shared a couple of dozens times by other supposed LightWorkers, linked not just the article, but also Hayley’s private FB page, her employer, and other personal information. For someone who is trying to “bring light into the world” Ms. Draper certainly seems to be trying to intimidate a young mental health professional. That reeks of darkness to me. And apparently a would-be bully, I would add. What sort of ethical complaints could these people make against Hayley? None. At all. On the Lost Ogle page she’s made no statements which are untrue, and the U.S. doesn’t have the sort of flimsy libel laws the UK does, so what sort of complaint would be made? Again, none. As a licensed psychologist who teaches classes on ethics, does continuing education workshops on ethical practice, and who trains master’s level mental health clinicians who are licensed by the very board Ms. Stice is going to make a complaint to, I can assure my dear readers that it will be literally laughed off. I am fortunate that throughout my journey, I have acquired numerous credentials and training that I can now share with my students: Certified Palmist, Certified MARI practitioner dealing with Carl Jung’s mandala research, Masters degree in counseling from the University of Oklahoma, and Nationally Board Certified Rehabilitation Counselor. Now that I am retired as a rehabilitation counselor, I am now ready to combine these skills and offer Sacred Circle for Lightworkers. 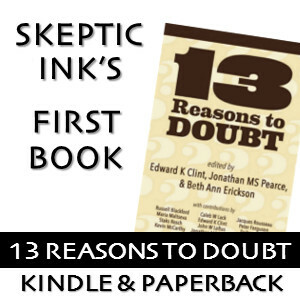 Given that there is great amounts of reason to doubt that palmistry is real, Jung’s hypotheses are pseudoscientific at best, talking to the dead via mediums is unintentional cold reading at best and a scam at worst, and astrology is nonsense, I am personally concerned about this person misleading the public into thinking she’s a licensed mental health professional. Ms. Draper, the original poster, advertises herself as providing Intuitive Consultations, Energy Healing, Empowerment Coaching, and Mediumship via “My LightWorker Institute.” She’s also a “Bible Best Mystic,” which is very interesting. Interestingly, lots of what the testimonials she’s posted sound like she’s also doing counseling, although Ms. Draper never uses the term herself. She’s also apparently giving out medical advice, which is certainly unethical. So, I will ask the question: Who is being unethical in this situation? 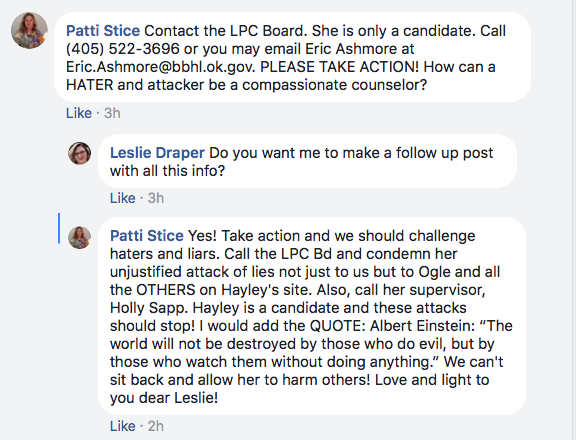 Hayley for writing two paragraphs of snarky but accurate copy and providing links to these Meetup pages, or Ms. Draper and Ms. Stice for threatening Hayley’s livelihood while at the same time taking advantage of the sick, hurt, and grieving by using non-supported, pseudoscientific practices? As no newcomer to stirring up controversy when it comes to so-called psychics and nonsensical mental health treatment, I invite Ms. Draper and Ms. Stice to engage in a public debate with me on these issues. I’m more than happy to find space to host us for a night of discussing these issues, open it up to the public, record it, and make it available on my YouTube channel. Alternatively, they should feel free to make a complaint to my licensing board about this article. It’s Caleb W. Lack, Ph.D., OK HSP #1143, and here’s the link for the complaint if you need that. Ummm. For the record, I’m not a lightworker. I know you didn’t say I was, but I feel the need to state it given the context of your article. Seeing how I’ve been drug into this shitshow in a public forum without full context of my part of the conversation applied.. I feel the need to add air to this fire. I probably would have shrugged the article off too.. but you and I.. well. We probably think and act differently than these folks and are both in positions that pretty much go like this: if someone doesn’t like our stance.. we can both say f’em and move on. Great spot to be in right? None of the baggage that comes with being in a marginalized lifestyle in the middle of a very conservative state. I’m not sure that the phrase “ripping people off” is not slander. The only people who can really say are the folks paying for the service. My issue was that phrase. How does the author know it’s a ripoff. Did she do any research? Maybe it is. It probably is, now that it’s in print. That’s the way it works, right? The author teaches healthcare ethics, right? So I actually took the article as an indirect ad. Cutting one person for the benefit of having an avenue to advertise. Kind of like this right? The more people we drag into this…the higher the search ranking on Google and win/win low cost advertising under the guise of something else. You keep my info up for your ad..I’d at least like a cup of coffee. Not the cheap stuff either. You and I both know that anyone can file a complaint to a board at any time and a quick investigation happens and if the person has done nothing wrong—absolutely nothing happens. Nothing. In my opinion that satire piece probably would have been so much better if the author had taken a moment of time to get a minimal bit of info about these folks before borderline/slandering someone…which we could also debate but I know some folks that are much more adept at law that either of us so .. we’ll stay in the lanes of philosophy, coffee and friendly agreeing to disagree. That’s an interesting perspective. Why is it considered bullying when the Lightworkers expose who the author of an article is. When said article makes light (pun intended) of who these lightworkers are? Especially when the author is supposedly a mental health professional. Implying that they are taking advantage of unsuspecting individuals without proof is considered slander. So provide proof or suffer the consequences of your unprofessional actions. BTW, before you jump up on your soapbox and chastise me, I have no connection to these Lightworkers. I find your article very dogmatic and quite judgmental. Of course most of psychology fits into the pseudoscience category, so that isn’t too surprising. Given that the author was not writing in a way related to her mental health background, and was instead for a satirical website, I think it’s bullying to try and do the low-level doxxing (personal FB page, her place of employment) that these people did. 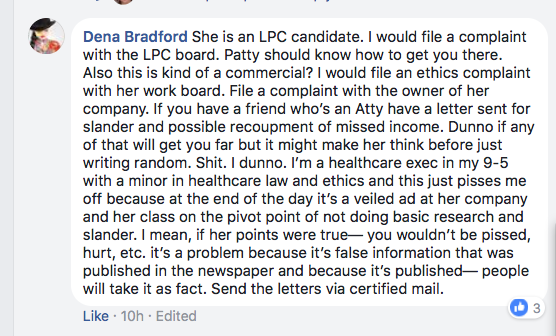 They then took it a step further and advocated (irrationally) for a complaint to her supervisor and to the licensing board. 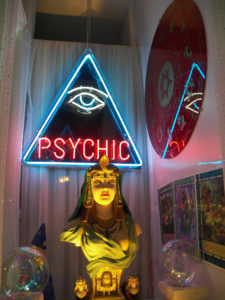 And I will stand by my assertion that they are taking advantage of people who lack an understanding of how psychics work, as there is huge amounts of evidence to support supposed psychics preying on the vulnerable and doing so with no evidence to support their “abilities.” Demanding proof isn’t slander.